with our family and friends! 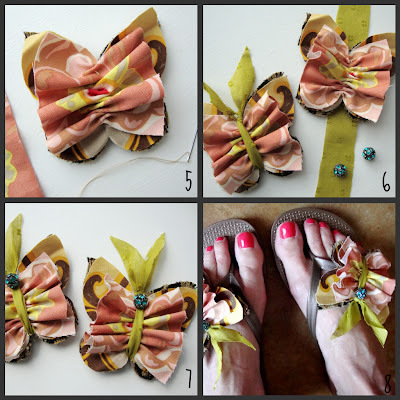 knotting at the top, trim ends to form "antennas"
and now try on your new perfect happy little summer shoes! OMG.. Those are the cutest things I've seen in a long time.. Just darling. such happy little shoes. i just love them!!! Jill, you have the cutest feet!! and ideals!! Your a doll!! I love your posts!! XO Take care, Fran. STOP being so cute. These are perfect and I love them! Those are precious!!! I was wondering what our flip flops were missing...butterflies!!!!! We'll be craftin' up some tomorrow!!! These are seriously cute! 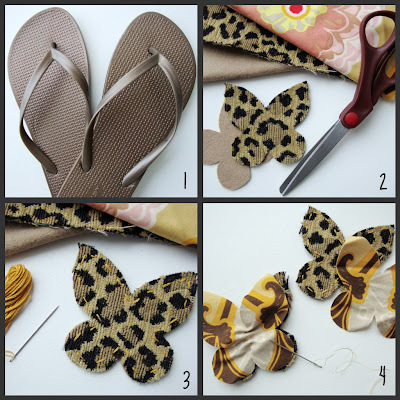 I am bookmarking this page so I can make some. The butterflies are adorable. We sewed your butterflies!! =) I blanked and could not remember where I got them from! I am so glad you stopped by today!! I am going to edit my post right now and shout you out!! forgive me for being so airhead=ish?! =) The 9-10 year old girls LOVED sewing them! ohhh emmmm geeee. super duper adorable! Thank you so much for taking the time to leave a little note! I truly treasure each one! Just a girl simply enjoying celebrating an artful life and feeling so truly Blessed to be able to combine my love for art and design with my deep love for my family! Also, a very "city girl" becoming a very "country girl" over the next several months- which I'm quite certain will provide even more simple joys to celebrate and loads of creative inspiration! Welcome to "a pocket full of posies!" -I don't know why, but garlands just always make me *swoon*! -i think my feet NEED these! -another treasure of a book! -a treasure of a book!!! A pocket full of posies button! Oh, pretty, pretty please ask before borrowing text or images from my blog! I'd just love to share!...simply click the email button and let me know! Thank you, thank you!